Here is the guy I fell for! 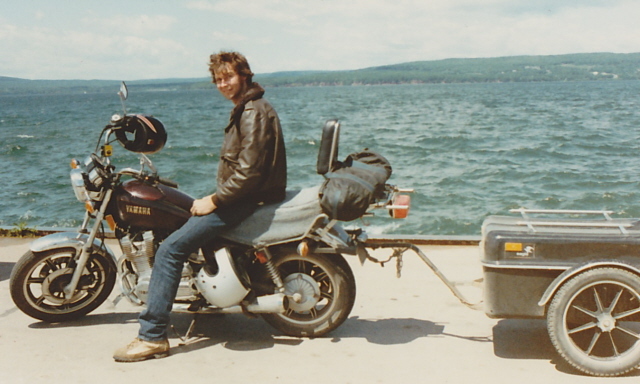 This photo shows Cliff on his bike, with our travel trailer, taken in the early 1980s. I am living in the 1980s, as I remember my past in order to realize my dreams for the future. I am writing my first travel memoir. Traveling Together: Cliff and Me and the Motorcycle Make Three is about the journeys I took with my husband which generated stories of love and adventure. During the past few years I have been composing my account of these stories during writing classes. 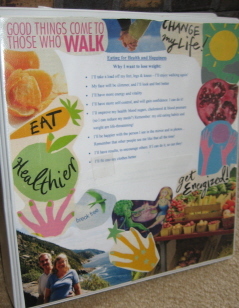 Now I am putting the chapters together to become my first e-book. I am well on my way to completing this memoir. My plans are to publish this as a Kindle e-book before I publish the book I have been working on: Realize Your Dreams: An Action Plan for Life Transformation. Last week I had the great privilege to participate in a writing workshop called Pilgrimages: Mindful Travel Writing & Memoir at Madeline Island School of the Arts, where I worked on this memoir. It was taught by Catherine Watson, an accomplished travel writer and inspiring instructor and mentor. I was part of a small group of students who poured our hearts out, writing in a supportive environment. My thanks to all involved. Did a mention that it was a fantastic experience?